Our cattle are born and raised on our farm located on the grassy hills of Northwest Georgia halfway between Chattanooga, TN and Atlanta, GA. We have genetically selected our cattle to produce high quality, lean beef off the native grasses and legumes our environment provides us. We have taken great steps to raise our cattle without the use of hormones or sub-therapeutic antibiotics. Our cattle are treated in the most humane way possible which means no confinement in feed lots. The processor we have chosen is USDA inspected committed to producing quality beef. We are a family run farm focused on farming with little impact to the environment. Taking these great steps allows our customer complete confidence in the products purchased from our farm. Our clients give testimony to the difference of deGraan Farms Grass-Fed Beef top quality flavor that stands out from other Grass-Fed Beef Producers. Learn more about us to see the deGraan Farms difference for yourself! From selective genetics to enviromentally conscious, deGraan Farms produces superior grass-fed beef. 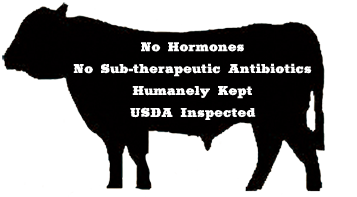 Our beef is USDA inspected, no hormones or sub-therapeutic antibiotics and offers better nutrition. deGraan Farms takes pride in personally delivering our grass-fed beef and other farm products directly to you. We base our delivery pricing upon mileage. Use our friendly, interactive map to find your individual mileage. deGraan Farms would love for you to join our farm family so that we can share educational information, keep you informed of area events and find out about sales on our products . Click the "Sign Up" below to join. Come back often to check out our farm blog! You will find fun farm stories, farm events, yummy beef recipes, and interesting educational information from deGraan Farms! Please feel free to participate by emailing us with subjects and questions that you are interested in learning about from deGraan Farms!